Tulip shalwars continue making waves in Pakistani fashion world. From teens to yummy mums, everyone is in on this trend and no matter where you are going, these will complete your outfit to the T. Our tulip pick is this tasseled number from Misha Lakhani’s Charbagh collection. Graceful and elegant with refined detailing, what’s there not to love? Tulip Shalwars with a modern twist,we present to you to you Rema and Shehrbano’s tapered shalwar with pleats and peekaboo lace. Perfect for this season of scorching heat, this easy breezy shalwar/pant is a much needed wardrobe essential. Dressing up a classic cigarette pant with feminine bows- Nazli Akbar’s bow tie cigarette pants are sleek, sophisticated and oh so chic! Dress them up with a straight kurta and sky high heels for a glamorous night out! 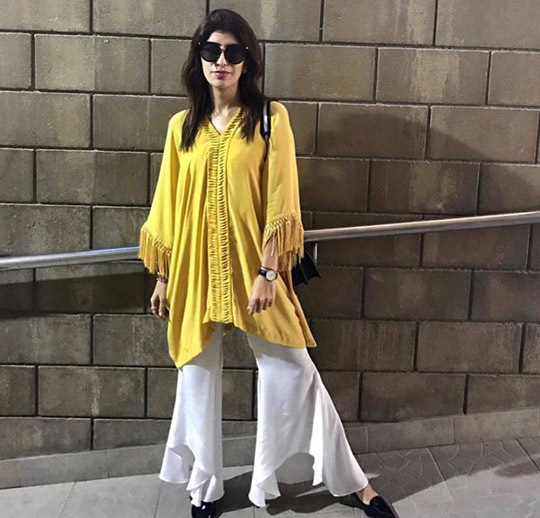 Farida Hasan just came out with the IT pants of the season that everyone is raving about. Straight pants with gorgeous pearl and bow tie details, these are your ultimate day to night staple trousers. Pair them with a summery kurta for an Eid garden party or dress it up with a nice wrap or cape for evening cocktails! The classic cut makes it a perfect choice for almost any occasions be it formal or informal. 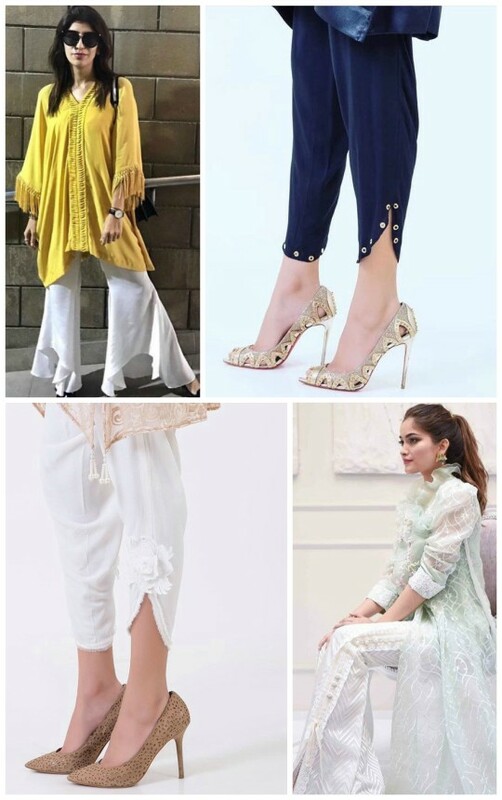 Get your ruffle on this festive season with these super trendy pants by Sehrish Rehan- you’ll definitely be making a style statement in these statement pants! No one does pants better than Ayesha-Somaya! Undoubtedly the reigning queens, they come out with a trendy new style on a weekly basis. The design duo definitely up-scaled the tulip shalwar with their studded version! The classic shape is playful yet refined and the gold studs add that extra sparkle that you need this festive season! Put your best foot forward in Ayesha-Somaya’s Rose Tulip shalwar pants. 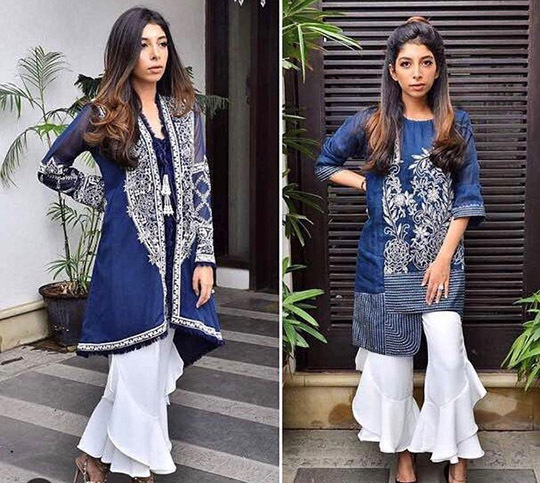 A modern mash up of the classic shalwar, its shorter and not as voluminous. The 3D rose detail adds the perfect touch of femininity to it! Whats not to love about these. Gharara pants are back with a bang! 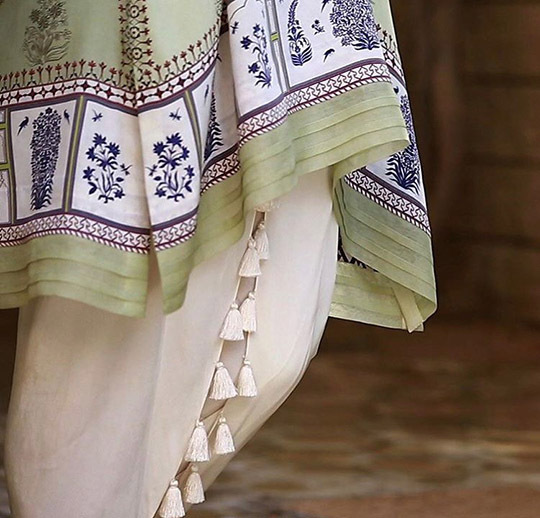 Sania Maskatiyas Gharara pants are contemporary take on a silhouette that’s been worn for decades around the world. These can be dressed up or down depending on the occasion. Traditional yet feminine, we’re glad this timeless look has found its way back to the Pakistani fashion scene. 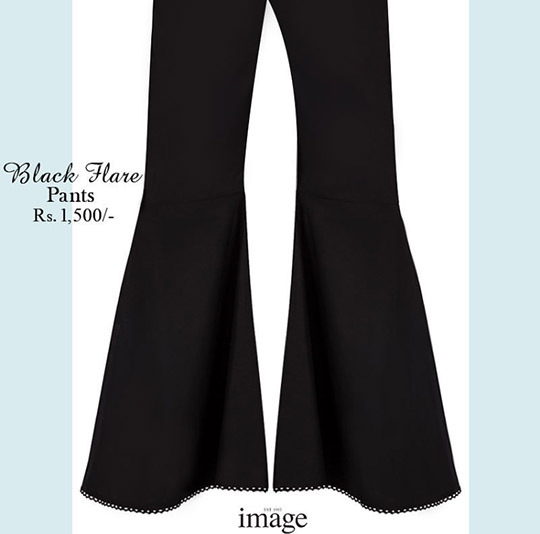 Add a modern flare to your festive look with Rema Sherbano’s Flapper pants! Graceful yet trendy, these easy breezy pants might just be our favorite new trend this summer! Beauty is in the details! We’re drooling over these perfectly detailed boot leg pants from Farah Talib Aziz’s latest ready to wear collection. Aesthetically pleasing and flattering on everyone, these deserve a spot in your wardrobe no matter what your style preferences are. Add some drama to your summer look with a pair of flared bell bottoms from Image Fabrics- they’re comfortable and oh so stylish; what more could you want on a hot summer day!